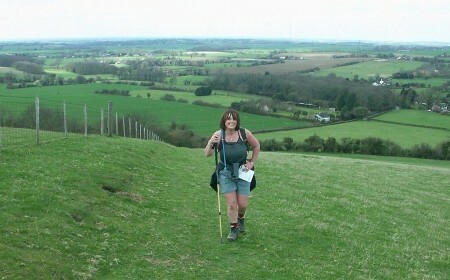 The Final Stage, Part 2 - Wye to Dover 23 miles. After taking the northern option via Canterbury to complete the North Downs Way we had intended to continue clockwise from Dover back to Wye however as we didn’t really enjoy that final stage or realise any sense of achievement in reaching the end of the way we decided to see what it would have been like had we taken the southern section and walk from Wye to Dover. This was also a more practical option for transport as we could park at Ashford take a train one stop to Wye and then catch a train back to Ashford from Dover. The book we have been following splits the final 23 miles from Wye to Dover into two stages, thinking that 11 miles would be too short and with few places en-route to drop down to a railway station we attempted to complete the final two stages in one day with an option to call it a day and drop down into Folkestone if we needed to (until we realised on the day that the walk was actually quite a trek from the nearest station making us think that it would be easier to continue to Dover). An early start, the downs were looking particularly nice in the early morning mist as we drove past on the way to Ashford parked and took the train to Wye, slightly concerned about a repeat of the disappointing ‘final’ Canterbury to Dover stage but optimistic about what lay ahead of us. Almost immediately our optimism was rewarded as friendly villagers wished us well – a contrast to a certain slightly hostile person we encountered walking her mastiffs on the approach to Dover. We are not really churchy people but Wye village church looked serene and lifted our spirits although not quite as much as the short uphill walk lifted our heartbeats afterwards. It was a nice warm morning and the views back across Wye towards the Downs we had previously walked on the Harrietsham to Wye stage stretched out in front of us, a small feeling of a sense of achievement was starting to build. 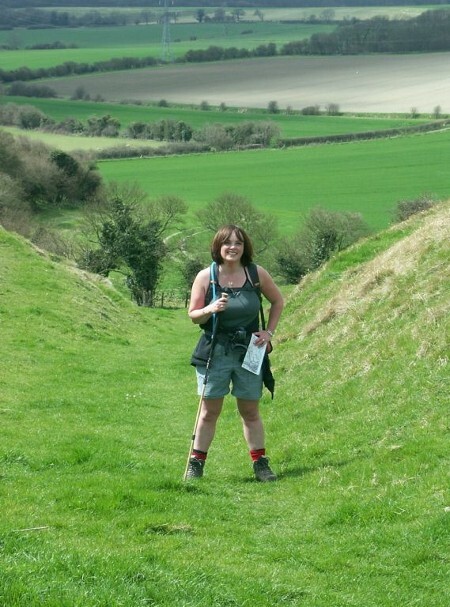 Jackets off and in shorts we headed off along the Wye Downs towards the Crown carved into the side of the hill with the sun at our side the memory of the dreary flat trudge from Canterbury to Dover was beginning to disappear. What followed next can only be described was a sandwich where all of the taste and good stuff was in the bread with the filling not quite matching the same standards. The filling being a stretch of road and trackway where the mud and ruts made the going a little difficult, the bread two wonderful slices of hill walking. Yes, HILL WALKING, before the trackway you have Wye, the spectacular Devil’s Kneeding Trough gouged out by glaciers and Broad Downs ok the views may not have been rugged rocky mountains but compared to our previous stage this felt like we were out in the Peak District or Yorkshire Dales unfortunately then the trackway and road numbs the senses a little, can’t have you getting too carried away with things otherwise you will be starting to think you are in Wales. After the trackway the path heads towards Postling and wow! Take away the electricity pylon add some hardened sheep and you are back into the Peak District. The land above Postling and on towards Etchinghill appears to have recently become Access Land and there appears to be lots of opportunity to explore and have short day walks amongst the hills. This recent status and creation of new ‘kissing gates’ at access points may explain the lack of North Downs Way markers but the direction is relatively logical as you just aim for some radio masts. We were approaching the half way mark and our spirits high, great countryside and no desire to stop, after the Radio transmitting station the path heads towards some woods – used for Army exercises and signs of their attempts to build camouflaged shelters were easy to spot. Showing my age again but I did start to think of Monty Python and the scenes where you see a field and the bushes start to move. Lizzie had read the guide book so we were expecting a steep climb out of Etchinghill and there it was up ahead of us, but first we passed through a really nice area with babbling brooks and stopped to chat to a young guy who was training for a planned Lands End to John O Groats walk later in the year, we wished him luck and started the climb with Lizzie muttering ‘ now I want to do the Lands End to John o' Groats as well ’ in the background. It really was a day for inspiration. Half way up the hill I took the opportunity of stopping on the pretext of chatting to a family and wait for Liz but in reality I was starting to tire. At this point the idea of slipping and falling down so that we would have to stop and go into Folkestone started to enter into my sub conscious but that would probably hurt too much and I knew how much Lizzie wanted to do the whole 23 miles even if she was on her knees at the end so we pressed on. Folkestone, a very different sort of landscape but in some ways just as interesting presents itself as the path traverses past the Eurostar International rail terminal and in the far distance France. It was surprising to see the numbers of people parked here or sat out on the hill looking at the view. What were they looking at? Some sort of Continental truckers appreciation society watching the lorries drive onto the train and head off through the tunnel? Or just the blue sea stretching away from Folkestone to France? 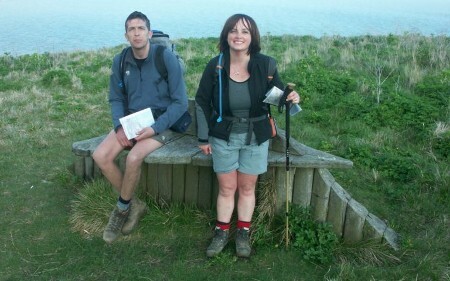 Well whichever, we were tired, joined them and sat just looking out to sea munching on our chocolate. Fortified by the sugar we took Castle Hill in our stride and headed along Crete Way for the final cliff top walk into Dover. Maybe it was tiredness but I started to get delusions and for a brief moment thought we had walked up some steep steps out of England and into the Greek Islands. Not quite mad, yet! Someone is building a Mediterranean style villa on the cliff top and very nice it looks too, pity the people who built the mock mansion we encountered at Eastwell Park on stage 8 didn’t have the same sense of style. There was a point on this final leg where I looked up saw Dover Castle in the distance, the railway and coast below which I knew headed off towards Dover and there was no sense of the castle getting closer. One foot passed in front of the other but I didn’t seem to be progressing. 5 miles to go and I started to think about getting the emergency blanket out crawling into it and finishing the rest in the morning. If I was feeling this bad I wondered how Lizzie was coping, someone passed us and as they shot away into the distance it was like we were stationary. I kept looking behind me expecting to see Lizzie slumped on the ground but all I saw was this determined look on her face as she gripped her trekking pole tighter and tighter slowly making her way along the cliff tops with her gaze firmly fixed on the way ahead. 3 Miles to go, we sat down for a breather and shared an energy bar, life started to come back into two pairs of very tired legs, the head cleared and we made one final charge towards the end. 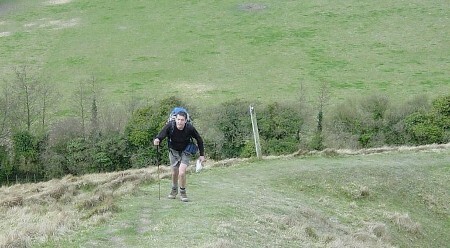 Nearly 10 hours after starting out from Wye we were heading up our final hill and down the street to Dover station. The northern route enters Dover with a more dramatic close up of Dover Castle whereas this southern section takes you past the ferry terminal and along slightly rough looking streets to the centre of Dover. This is the only bonus that could be gained from finishing the walk from Canterbury, blame it on the Romans for choosing the highest point for their fort, very functional but it left little of interest on the harbour side of town. 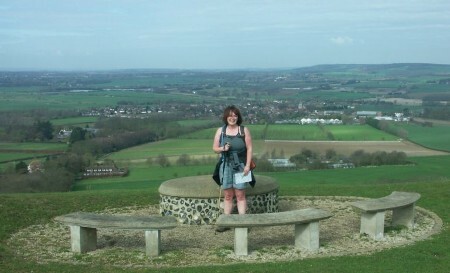 Doing this walk has taught us a lot about what is on our doorstep the places and wildlife, although we walk regularly there were a number of things we only really saw for the first time along the North Downs Way and in particular Woodpeckers. In a cute sort of way they have become a symbol of the walk, Lizzie hadn’t seen one before and I certainly have never seen so many. It was rather fitting therefore that just as we made our way towards the end of the cliffs and a sculptured seat inscribed ‘North Downs – The backbone of the South East‘ that a woodpecker would fly up close to us and sit on a fence beside the path.